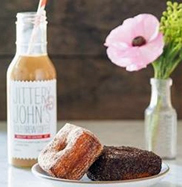 Jittery John's cold brew coffee is made with fair trade, organic coffee beans. They have many sizes and varieties to create the perfect coffee beverage. 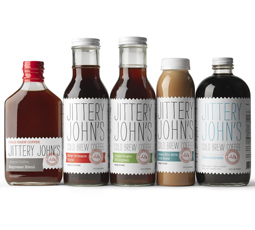 Founder of Jittery Johns, Kristina Barnes, didn’t set out to start a beverage business. It happened by accident. She reluctantly tried a friend’s unlabeled new kind of coffee experiment called “cold brew”. She was instantly hooked after the first cup, and knew that if she liked it that much, others would too. No one knew what cold brew was when she got started. She explained it to literally everyone who stopped by. One thing was clear: people loved it! During their first year, she kept her day job as a user experience researcher, where she spent days talking to people about what worked and didn’t work on electronic screens. While she didn’t have previous grocery experience, her background in product design and consumer research and marketing gave her a strong foundation to develop an engaging line of beverages. She hustled at night and on the weekends, did deliveries before work, and got a lot of positive market validation. Their second year, they took on more big accounts, word started getting out, and cold brew started gaining in popularity. Kristina knew there was something important happening at that point, so she quit her job to focus exclusively on taking Jittery John’s to the next level.